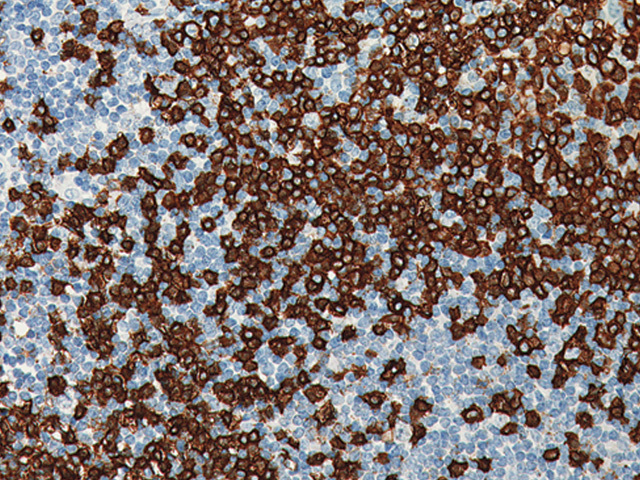 α-Methylacyl coenzyme A racemase (AMACR antibody), also known as P504S, is a peroxisomal and mitochondrial enzyme that plays a role in bile acid synthesis and β-oxidation of branched chain fatty acids. 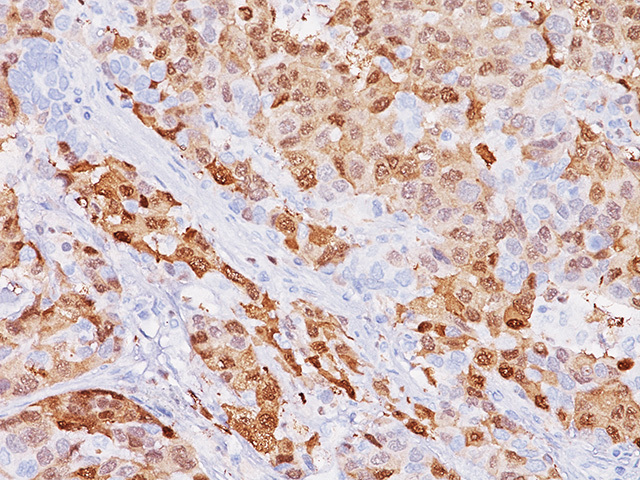 In immunohistochemistry (IHC), AMACR antibody has been shown to be a specific marker of prostatic adenocarcinoma. Additionally, prostate glands involved in PIN have been found to express AMACR, where as AMACR was nearly undetectable in benign glands. 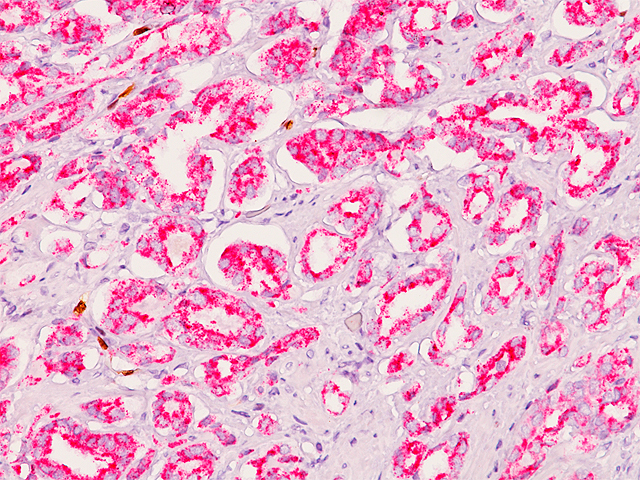 AMACR (RM) antibody stains the majority of prostate cancer; however, AMACR has been shown to stain many other types of carcinomas such as but not limited to hepatomas, breast carcinomas, pancreatic and islet tumors. 1. Tacha DE, Miller RT. 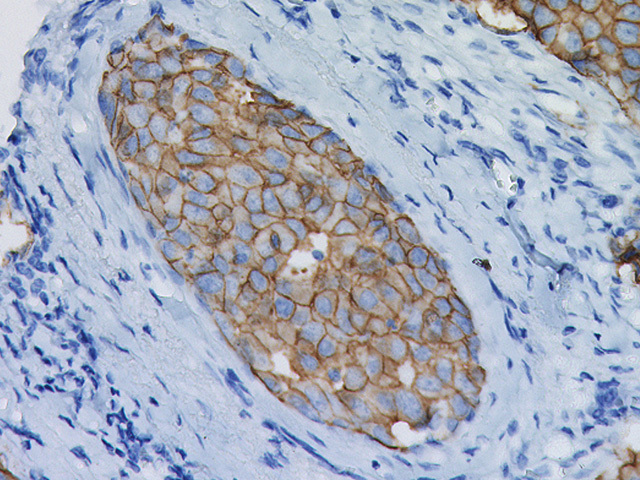 Use of p63/P504S monoclonal antibody cocktail in immunohistochemical staining of prostate tissue. 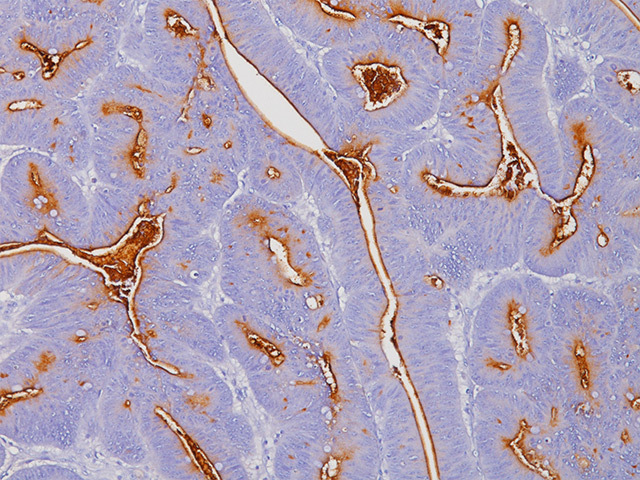 Appl Immunohistochem Mol Morphol. 2004 Mar; 12(1):75-8. 2. Hameed O, Humphrey PA. Immunohistochemistry in diagnostic surgical pathology of the prostate. Semin Diagn Pathol 22, 88-104 (2005). 3. Trpkov K, Bartczak-McKay J, Yilmaz A. Usefulness of cytokeratin 5/6 and AMACR applied as double sequential immunostains for diagnostic assessment of problematic prostate specimens. Am J Clin Pathol 132, 211-220 (2009). 5. Clinical and Laboratory Standards Institute (CLSI). Protection of Laboratory workers from occupationally Acquired Infections; Approved guideline-Third Edition CLSI document M29-A3 Wayne,PA 2005.